In 1995 we were told that the Japanese tanks knocked out here in October 1942 were still sunk in the sandbar and visible at low tide, so down we went to the beach to have a look . Photos from the war show at least 5 disabled tanks on the sandbar , but most of these were later blown up. Some other Jap tanks captured west of the river were recovered for evaluation. I am told that only 1 tank hull remains in the water. Afterwards, Coastwatcher Martin Clemens has told me that he inspected these tanks on the sandbar and found a bottle of alcohol in every turret! In 1995 we were told that the Japanese tanks knocked out here in October 1942 were still sunk in the sandbar and visible at low tide, so down we went to the beach to have a look . 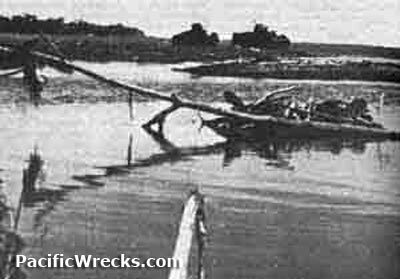 Wartime photos show at least 5 disabled tanks on the sandbar, but most of these were later blown up. 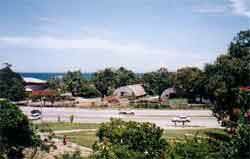 At the time, the sandbar area is now covered by lots of huts of refugees from Bougainville . Suffice it to say that yes , we saw a tank turret sticking out of the water but there was no way we were going to wade out to it, as sanitation left a lot to be desired in the area. It took us two hours to scrub the soil off our shoes and they smelt for weeks. 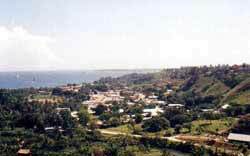 In 1996 we were not about to go walking along that shore again , so took the comparison photo from the edge of the Honiara Hospital car park - this was the closest shot possible . One guy was looking at us rather suspiciously and asked what we were doing , but when we showed him the 1942 photos he became quite interested and lightened up. As we returned to the car our taxi driver was cracking up laughing and when we asked him why he said "..because the area in the water around the tank is the women's toilet - he thought you were trying to take photos of them - sorry , I should have told you!". Neither of us were eager to contemplate salvaging a Japanese "toilet" for posterity at that moment! At the Vilu Museum they have a Japanese medium tank turret that they said came from one of the tanks here - it had taken a hit on the gun that had blown the barrel off . On Skyline Ridge overlooking the Matanikau River a large US memorial was dedicated in 1992 giving details of the entire campaign. It is very impressive and the view across the coast and Iron Bottom Sound is excellent.